The Aegean originates from the Cycladic Islands of Greece. Its a relative new breed and still te be officially recognized as breed. The Aegean was not crossbred as a race, but developed naturally. This is rather unique for a recent new breed. The Aegean is a medium-sized cat. Its coat is made of mostly down-hair that the cat can shed in the summer and protect them from the cold in the winter. Their coats can come in a different variety of colors. They have the facial features of an oriental breed and their ears are slightly large. These cats are great family pets, their love for people was developed by evolution rather then purposely bred. 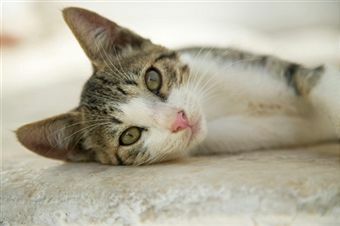 They have a close bond with their family and owners but can be somewhat shy of strangers. They need and love exercise and playtime. Like all cats, the Aegean needs at least a weekly brushing to get the coat weather resistant and healthy. In the wintertime their coat can need extensive attention. Overall not a heavy maintenance breed. The Aegean is a generally healthy breed, have the advantage of not being bred much because of the natural development of the breed.